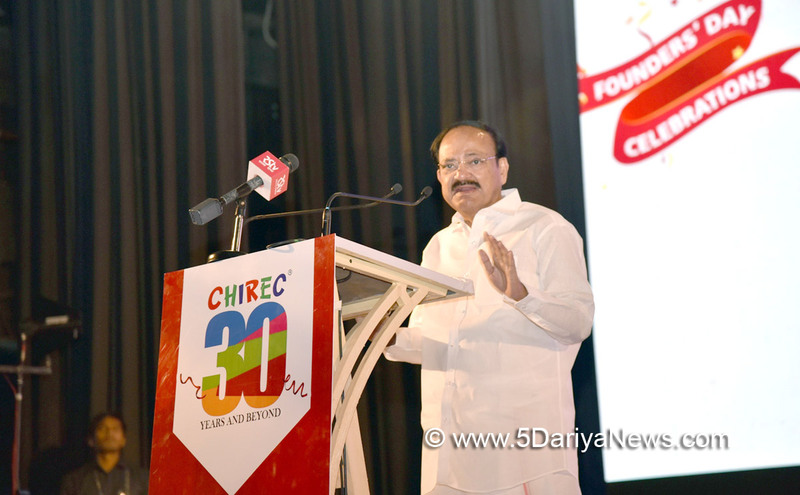 The Vice President of India, M. Venkaiah Naidu has said that India is quickly becoming a global leader and lifting millions out of poverty and added that country requires skilled youth to accelerate the growth process.Addressing the founder’s day celebrations of CHIREC International School in Hyderabad today, he stressed on the need to teach students the great culture, heritage of India. He asked Educational institutions in the country to take an active lead and revamp the system to make it more relevant and contemporary and ensure that our institutions churn out ideal citizens.The Vice President said that the mechanical fashion of memorising the subjects must go and said that such rote method of learning is detrimental to overall personality development of the child. Education must foster creativity, critical thinking, open learning and impart analytical skills. It must help students to become good human beings, he said.The Vice President suggested educational institutions and policy makers to take steps to reduce the burden on students. First and foremost, the syllabus at the school level has to be drastically cut to reduce the load on students. The time spent by students in school should be divided equally between the classroom and play field, he added. The Vice President said that the participation in sports and other extra-curricular activities will help in improving physical and mental health, and fostering active citizenship and social inclusion.Stressing the need to inculcate strong ethical and moral values in students, the Vice President called on educational institutions encourage students to embrace the spirit of nationalism and patriotism. Develop the feeling of oneness among students, he added.Saying that holistic development of student is important for a student to make informed choices, Shri Naidu said that education must help students to become good, compassionate and caring human beings with a sense of empathy.Highlighting importance of India’s own Gurukla System of education, the Vice President said that Educational institutions which are considered temples of learning must teach students to respect the Guru, the teacher. Students entering schools, must not only show respect to the Gurus, but also display complete dedication and discipline towards the entire process of learning, he said.The Vice President said that the teaching methods should become interactive and facilitate the students to express their doubts and raise questions freely without any inhibition and fear. Such an atmosphere will instill confidence in children, an important prerequisite for their overall development, he added.The Home Minister of Telangana, Shri Nayani Narasimha Reddy, the Principal, the Director and Faculty of CHIREC International School and parents of children were among the attendees.